Mason Gaffney has shown how many individuals helped construct neoclassical economics, often with financial support from the robber barons and their successors. 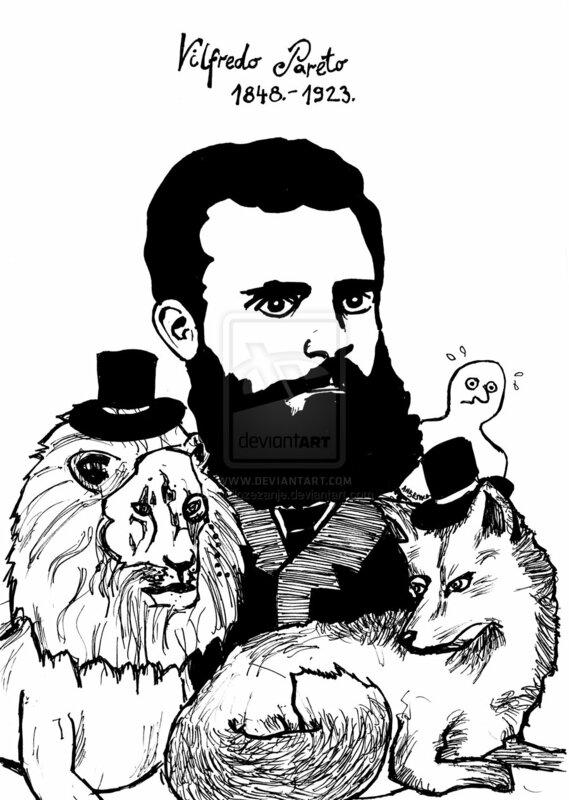 I will focus on two: in the United States, John Bates Clark (1847-1938), and in Europe, Vilfredo Pareto (1848 to 1923). Recall from Part I that the classical economists divided society into three classes: Owners of land and other natural resources received unearned income or “rent” from their holdings—often derived from conquest or inheritance. Capitalists (who often overlapped with landowners) owned physical capital (like factories or ships) and received interest or profit from investing. Workers received wages. Also recall that the classical economists favored taxing “rent” by taxing land values; Henry George crusaded for this tax. John Bates Clark of Columbia University, for whom is named the prestigious John Bates Clark Medal, transformed economics into an inequality-free abstraction. Clark reduced economics to only two “factors of production”, capital and labor. In Clark’s model, “supply and demand” in a free market ensure that capital and labor each earns its “marginal product”, that is, the contribution of the final amount supplied. This outcome is supposedly both fair and efficient. Clark writes, “the share of wealth that falls to any producing agent tends, under natural law, to equal the amount that he creates. A man’s pay tends to equal the value of the product or fraction of a product that can be specifically imputed to him.” (Clark, 1898: 4) So much for any claim that laborers are exploited! Clark also eliminated time, —giving us the familiar time-less, space-less, context-less world of Economics 1. But without time, there can be no history, and without history, no questioning the justice of property ownership, or the legitimacy of institutions. Meanwhile, over in Europe, Italian nobleman Vilfredo Pareto made two key contributions to the emerging neoclassical paradigm. First, he estimated that 80% of the land in Italy belonged to 20% of the population, from which he concluded that inequality follows a natural law: the 80:20 rule, with which we shouldn’t tamper. More famously, he developed the policy rule known as “Pareto improvement.” Pareto improvement holds that we should undertake no policy changes unless they make at least one person better off and no one worse off. Sounds fair and reasonable, doesn’t it? By that logic we should have paid the slaveholders in full after the Civil War! By that logic once having cut taxes on the rich, we cannot raise them again! The status quo rules, no matter how cruel or illogical the route that got us there. Under the new neoclassical regime, mathematical models proliferated like kudzu vines in the south, their very complexity keeping them safely obscure. Few are more famous (among economists) than Robert Solow’s 1956 simple two-factor growth model. Assuming a world of uniform depreciating physical capital (implicitly ignoring durable natural resources like land), and uniform quality labor, Solow’s model predicts that economies will grow towards a steady state where depreciation just equals new investment. And because the richer you are the slower you grow, poorer economies and poorer people within economies will catch up. Solow’s model is cute as a button!—but its extreme abstractness lies poles apart from Smith’s original common sense model explaining growth in terms of cooperation and specialization. Almost sixty years later, Thomas Piketty has taken Solow’s model and added his own twist. In Solow’s model, the poor catch up to the rich. In Piketty’s model, the modern decline in growth does not affect investment. Consequently, now that return to capital investment exceeds the rate of growth, then inequality must inexorably increase. This model, he says, determines the fate of the twenty-first century. Critics have torn into Piketty’s model—including some, like James Galbraith, who still give Piketty kudos for stirring up debate. In my view, Piketty’s and Solow’s models are both fundamentally flawed in that they rest on the same ahistorical, apolitical, two-factor neoclassical foundation. As the classical economists understood, inequality derives from power, ultimately the power of conquerors to extract tribute from the conquered. And as the Progressives, the New Dealers, and the civil rights activists have demonstrated, democratic societies can counter that power with well-designed tax and regulatory policies supported by an aroused public. We are not prisoners of a mathematical model.